Colin Kaepernick Calls Trump And Clinton "Proven Liars" Who Were "Trying To Debate Who's Less Racist"
Hillary Clinton won the presidential debate because Donald Trump is a bad man who is bad at most things. But acknowledging that the two-party system dominates American politics doesn’t mean you have to buy into moral relativism. 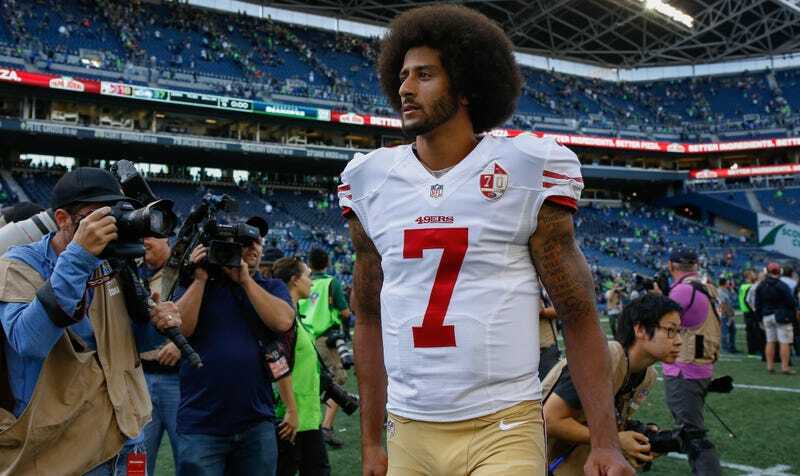 Colin Kaepernick watched the debate and despaired at both choices. That’s offensive, and it’s downright wrong. First, in assuming that Kaepernick needs or wants “support”—his anthem protests exist to make a point, and to force people to confront ideas and undercurrents they don’t want to confront, and those motives aren’t affected by whether you agree with his opinion of Hillary Clinton. Second, looking at that blockquote above ... I’m not seeing anything untrue there. Speaking of Obama, the president addressed Kaepernick’s protests at a town hall-style talk attended by military members and their families, and he struck a conciliatory tone. Because we know Obama reads Deadspin every morning: Colin Kaepernick’s protest has nothing to do with the military.